The FIG has released a list of the qualifiers for the World Cup Final who have confirmed their participation plus the next gymnasts down the list who will be invited. The lists are prettty much as predicted. Participants are Cheng Fei, Elena Zamolodchikova, Jana Komrskova, Ariella Kaeslin and Dorina Boczogo. The next three down the list are Hong Su Jong, Aagje Vanwalleghem and Olga Sherbatykh I’m thinking we can count out Hong (Hong Un Jong has already said she would not participate, and while I realize they are not the same person, it seems like a good predictor). Sherbatykh is also out. Vanwalleghem is likely to compete, which moves Hong Mi Kang (ranked 18th) into the last qualifying position. 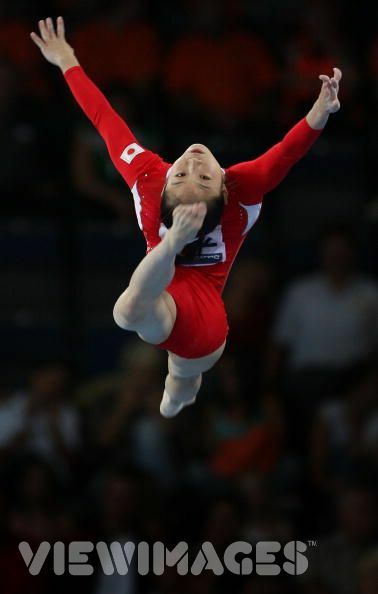 She recently took first on vault at the 2008 Asian Games. According to the FIG, Dariya Zgoba has confirmed her participation, which makes Zgoba, He Kexin, Jana Sikulova, Yang Yilin and Anastasia Koval the qualifiers. The next invitees are Jiang Yuyuan, Vanessa Ferrari and Iryna Krasnianska. Jiang will almost definitely participate, Ferrari is definitely out, and I’ve heard that Krasnianska is probably out too. The first replacement would be He Ning (17th) and the second is … Koko Tsurumi (18th)! Fei qualified first onto beam (as well as vault and floor) and is followed by Sandra Izbasa, Li Shanshan, Yulia Lozhecko and Daniele Hypolito. Hypolito has already confirmed her participation, though Elyse Hopfner-Hibbs is actually ranked above her. Although Hopfner-Hibbs curiously declined her invitation on bars, she has expressed a desire to compete on beam if qualified, but rumor has it that she has already decided against participating because of final exams, etc. The next two invitees are Lauren Mitchell and Deng Linlin. I am curious about the Li confirmation, because she had been sent back to train with her provincial team. I presume, though, that the FIG did not get this wrong (though stranger things have happened). Even if Hopfner-Hibbs competes, we probably still have one place left because Deng is rumoerd to be injured. Next on the list is Lenika de Simone (18th), whose participation (if I’m not mistaken) would put Naomi Ruiz out of contention on floor, because Spain is only allowed to nominate a competitor if they have no other qualifiers. Should de Simone decline, next up would be Zgoba (19th), qualified and confirmed on bars, and Alina Kozich (21st), who is qualified and confirmed on floor too. Fei is first, followed by Izbasa — just like beam (which is exciting!). They are followed by Jiang, Kozich, Suzanne Harmes and Hypolito. Zamolodchikova is first on the next list of invitees, and will undoubtedly participate. Patricia Moreno is next and retired, so that’s not happening. That leaves one spot to fill on floor, which could theoretically go to Daria Joura (16th), but the most likely competitor is Tsurumi, who is now likely qualified for two events! It’s shaping up to be a good final, presuming everyone makes it to Madrid with no further injuries. I’m predicting Cheng on vault and beam and Izbasa on floor, but I don’t put much stock in my own predictions. I’m still calling He on bars. I’m doubting will see any major upsets. It would be nice to see Zamolodchikova on the podium, but I think it’s a long-shot. Kaeslin has a decent shot at a medal on vault. The bars final could easily go Chinese 1-2-3 with He Kexin, Yang and Jiang. I have no idea about what kind of shape Li is in, but she could definitely compete on beam, as could Mitchell, though I have them competing for bronze with Cheng and Izbasa in the top two spots. On floor, Kozich could squeeze in for a medal, but I would expect Jiang to take third.